The following is taken from Wikipedia. Stoke Holy Cross is a village in South Norfolk which lies approximately 4 miles (6.4 km) south of Norwich. Stoke sits on the River Tas. It covers an area of 9.27 km2 (3.58 sq mi) and had a population of 1,568 in 674 households at the 2001 census. The village is accessed from the south of Norwich, about a mile east of the A140. West of the village, the parish boundary meets Swainsthorpe along Stoke Lane. The boundary crosses the A140 and the Great Eastern Main Line as Hickling Lane. North of Sprow's Pits it meets Swardeston, and passes west of an electricity substation. The boundary follows the A140 northwards, to the west, and east of Mangreen Hall. A few hundred metres south of the A140/A47 interchange it meets Caistor St Edmund, where the parish includes the Mangreen quarry. It crosses the A140 and the railway to meet the River Tas, which it follows southwards, with Dunston. It follows Chandler Road, part of Boudica's Way, eastwards and north of Notre Dame Wood. It passes north of Highfield Farm and Narborough House, and Upper Stoke (part of the parish). It passes on the western edge of the transmitting station (a former radar station), and at Stoke Road it meets Poringland. South of Upper Stoke, it passes through Brickle Wood and along the western edge, and follows Brickle Wood through Abbot's Farm and meets Shotesham. It follows Willow Brook to the south of Warren Plantation. It passes to the south-west of Maltkin Farm, meeting Swainsthorpe east of Swainsthorpe Hall. There are two tall radio towers to the east of the village. One is one of three former Chain Home radar towers from the Battle of Britain, then known as RAF Stoke Holy Cross. The cache is a very straightforward traditional. 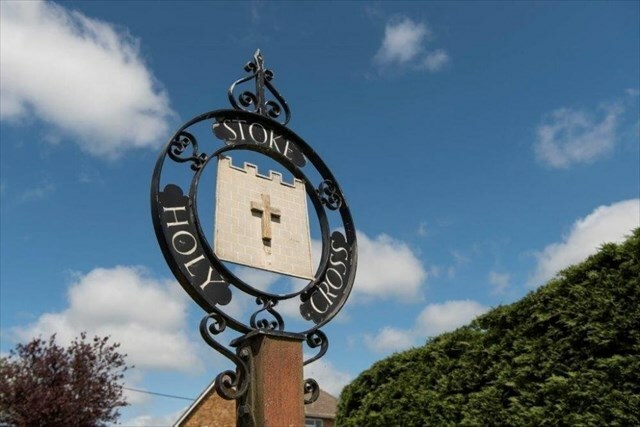 Enjoy the Village sign and Stoke Holy Cross.